Just finished reading an EXCELLENT article by my friend Katy on how to encourage walking with your children. When it comes to children, walking is essential to developing the human body. Each type of exercise has its benefits, but the mechanoreceptors throughout the human form require walking (and a lot of it) to fully develop all the systems. Walking is not an option. It’s a requirement. For you, and your kids. …first model the behavior you’d like to see in your children. And then, after you’ve been a good little walker for some time, begin to insist the entire family walk — first short walks and then longer as the bodies adapt for better endurance. If you’re thinking “Insisting on something with my children won’t work!” please consider the must-dos in your home. Do they have to do their homework? Do they have to be kind to others? Why wouldn’t “have enough endurance to move your skeleton around without some sort of contraption” be on the list of your family rules? The “brushing the teeth rule” is in most homes. Walking daily is actually more important to health than brushing your teeth, and brushing your teeth is pretty gosh darned important. Your kids do it, though, because for some reason, the dental committee really made a compelling argument that people subscribe to, so you brush your teeth at least once a day. What is the first thing we should teach our children? When I ask women this question at seminars they give me lots of very good answers, but usually not the one I am looking for. What is my answer? I believe that the first thing we teach our children is how to listen. If children do not learn how to hear, they will not learn to obey. If they do not learn to listen, they will not learn to hear the voice of God speaking to them. If they do not learn the art of listening, they will not learn to acquire knowledge. If they do not learn how to hear, they will not come to faith, because “Faith comes by hearing, and hearing by the Word of God” (Romans 10:17). How you train your children to hear will determine their relationship with God! It is possible to hear but not really hear. That’s why Jesus constantly said, “He that has ears to hear, let him hear.” We have to learn to listen with our ears but this takes training. All parents are ear trainers. By the way we parent; we train our children to have obedient ears-or, disobedient ears, lazy ears, dull ears, defiant ears, resistant ears, gullible ears or even forgetful ears. What kind of ears are you training your children to have? When you ask them to do something but they take no notice of you, you are training them to have defiant ears. When you ask them to do something but they delay doing it, they have dull ears. When you ask them to do something, but they don’t bother doing it until you have asked for the sixth time and by now you are shouting, you are telling them that they do not have to obey until the sixth time! You are producing lazy ears. What will God have to do to get their attention? What kind of ears does God want our children to have? When God told Solomon that he could ask God for anything he liked, Solomon responded by asking for “an understanding heart” (1 Kings 3: 9). The margin in my Bible gives “hearing” for “understanding.” The Hebrew word is shama and means, “to hear with attention and obedience, to give undivided listening attention.” This is what Solomon wanted more than anything else, more than riches and fame-a hearing heart. May God give us wisdom to teach our children how to have hearing hearts. Proverbs 1:5 says, “A wise man will hear, and will increase learning.” There is no way we can teach our children to be wise without teaching them to hear with undivided attention. When King Saul disobeyed the word of the Lord, the prophet Samuel came to him and said, “Hath the Lord as great delight in burnt offerings and sacrifices, as in obeying the voice of the Lord? Behold, to obey is better than sacrifice, and to hearken (qashav) than the fat of rams. For rebellion is as the sin of witchcraft, and stubbornness is as iniquity and idolatry.” (1 Samuel 15:22-23). The word qashav describes acute hearing. It means “to prick up the ears, sharpening them like an alert animal.” Children with qashav ears will be ready for God to use as soldiers in His army. How do we teach our children this kind of hearing? As soon as they can understand a command, we teach them to obey that command. But before they can obey, we must make sure that they have heard us. Sometimes, you may have to get your little child to repeat your command to make sure they have heard you. Don’t yell commands from another room. Always give commands eye to eye and face to face so that you know your children have heard what you ask them to do. When you know that they have heard, teach them how to obey straight away. Don’t accept anything less. This takes time and effort, but remember, mother, you are an ear trainer! This is one of your most important tasks as a parent! May God help us to be parents who train prompt and obedient hearers. I am a diligent ear trainer! Many women like to save these devotions. They print them out and keep them in a folder to read over and over again. Some print them out and pin them on the fridge with a magnet to read through the week. If you are printing this devotion and need it to be smaller, highlight and change to a smaller font. Leaving homework, dinner schedules, and bedtimes to chance has a tendency to create chaos and frustration during possibly the only family time of the day. Establishing a routine does not have to mean never allowing for flexibility, but it gives parents and children alike the feeling of comfort that comes from knowing what is expected. Children may begin to receive homework assignments as early as Kindergarten. Oftentimes in these early educational years, it falls to the parents to motivate children to finish their homework. Even in the later part of a child’s education, he or she may need structure and guidance. Some families choose the time directly after school to get homework done for the day. Others feel it may be better to allow children to decompress after a long day of concentration and constant social interaction. Should a child complete homework before or after dinner? The answer to that question depends upon the dinner, extracurricular activities, and bed times for each family. Determine which times are best for your child to sit down to homework. Once a routine is established, there should be less fighting about getting it done, fewer homework assignments turned in late, and happier parents and children. A dinner schedule that works for the whole family is beneficial to everyone. Predictable meal times will encourage children to refrain from ruining their appetite with snacking. Children and parents should work together to put dinner on the table for a family meal. For some families that might mean one person either cooks or picks up food on the way home. Someone else then sets the table, and another family member fills drink cups. Bedtime is another aspect of the afterschool routine that should be consistent. Younger students require more supervision and earlier bedtimes. Whether you incorporate a time for reading together or alone, children will benefit from an opportunity to lie quietly and cultivate the habit and skill of reading for pleasure. Afterschool routines may change from year to year and from family to family as there are many factors involved such as age, siblings, and parents’ work schedules. Maintaining a consistent and reliable routine will give your child a feeling of stability during the formative years of his or her youth. Jennifer Tankersley is the creator of ListPlanIt.com where you can find over 400 lists and planning pages including a Back to School Planner, Homework Schedules, Calendars and many more and also of List Mama Blog: Lists for List-Lovin’ Mamas. Reading for children is an important part of their development. By developing their reading skills, your child will become better at spelling, understanding ideas and concepts and develop positive language skills early on. Reading is also a lot of fun and a great bonding activity for parents and children. But how do you raise a good reader when you’re competing against a host of electronic devices? #1 – Read daily. Reading little and often is better than leaving large gaps of time between reading. By making reading a daily activity, you cement that reading is important and just a “part of life” in your child’s mind. Set a routine of a short bedtime story or a story after lunch or dinner each day so you don’t forget. #2 – Visit the library. Many children today have never visited a library outside of school. There are so many other activities and things competing for your child’s attention that the library may be last on their list. But most kids respond positively to an outing at the library. Make visiting the library a regular activity and you’ll children will start to look forward to it. The library can be a magical place for children and many have activities to help promote reading that are both fun and educational. #3 – Start a book club. This can easily be done by joining forces with a few other parents. Meet weekly with the children to discuss a new book. This way the children not only see their parents getting involved, but also have the chance to develop grown-up conversational skills at the same time. Discuss the book and then enjoy a few treats; make it fun so that the kids really look forward to it. #4 – Lead by example. If your kids see you reading from a young age, they may want to do the same thing mommy or daddy are doing. Show your kids that reading is a normal, fun part of life. Tell them about the latest book you’re reading and why you enjoy it. Show them the Sunday newspaper and explain how you learn what’s going on in the world by reading it. #5 – Read at bedtime. As mentioned above, reading at bedtime is wonderful for both children and parents. It gives parents and kids a few minutes to connect at the end of each day. You can share a story and then discuss a few of the characters. Reading is a great way to unwind and will become a welcomed addition to your bedtime routine. #6 – Let them choose. Reading tends to become less exciting as children grow. Give your children access to a variety of suitable reading materials to help them realize that reading is fun at any age. Whether it’s comics or “how to” books, by providing fun and informative reading material you’ll keep your child hooked and involved. Another great option for older kids is to share their reading book with mom and dad. You can each read the same book together a few evenings a week. Your child can read one chapter out loud, then you read another and so on. This not only helps you spend time with your child but you get to enjoy a story together. There are some fantastic teenage mystery and action books that most young adults will really enjoy reading. While raising a good reader may seem to be a harder job than it once was, it’s not too difficult a task. By exposing your children to books from a young age and creating an enthusiasm for reading, you’ll lead by example and help to raise a good future reader. Giveaway – Adorable teddy bear! This is a quick contest – entries close on January 30. Winner will be chosen and posted on February 1. Perfect for this time of the year, this adorable Make Your Own Stuffed Animal kit can you yours when you enter our giveaway. 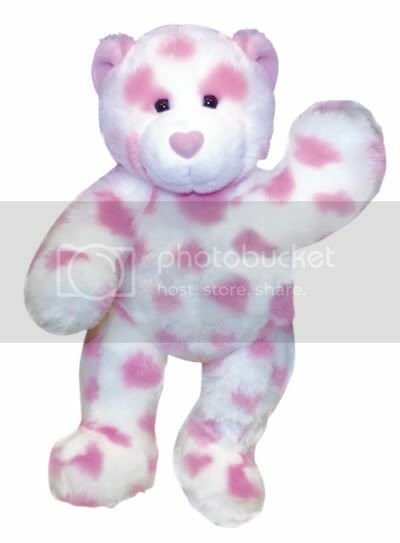 You’ll get this lovely white bear with pink hearts and a pink heart nose complete with stuffing and a birth certificate ready for you and your child to stuff together (just like Build A Bear but in the comfort of your own home). Comment below with the name of who will be stuffing this bear and his/her age (first names of children please). 1. Tweet about our contest. Link directly to the contest page here: http://parentingzoo.com/members/?p=869 . Come back here and comment with the link to your tweet. 2. Blog about the give-away and come back and comment with the link to your blog post. 3. Subscribe to our RSS feed then come back and comment that you’ve subscribed. Adopting a child is an exciting and wonderful event. The process will go a lot more smoothly if you prepare yourself with knowledge about how adoption works before you begin. Here are some things to keep in mind as you consider the adoption process. This is the most important decision you will make as you begin the adoption process. In an open adoption, an adopted child can maintain contact with his birth parents. An open adoption includes letters, emails, phone calls, and personal visits. It can be helpful for the child’s sense of wholeness and healing to be in contact with his birth parents, but this depends on the situation and lifestyles of the biological parents, of course. As the adoptive parents, it is your decision as to whether you will allow open contact, but it should be a child-focused decision. It’s not about your convenience or preference; it’s about what is best for the adopted child. Semi-open adoptions limit but do not prohibit the contact the adopted child can have with her birth parents. Generally, semi-open adoptions include receiving written correspondence and gifts from the biological parents, but no personal visits or phone calls. Closed adoptions mean no contact is allowed between the adopted child and her birth parents. Domestic adoptions, or adopting a child from your own country, can mean a long wait. Also, babies and children up for adoption in the United States tend to have behavioral or physical problems, which may or may not be an issue for a prospective adoptive parent. It is easier to obtain the medical history of the child in a domestic adoption, however. The cost of domestic adoptions varies according to state, but generally they include an application fee, attorney fees, psychiatric and physical examinations for parents, and supervision after the adoption. These and any other costs or fees as per your state range in cost from $5000 to $40,000. Almost always closed, international adoptions are comparable in cost to domestic adoptions, averaging between $7000 and $30,000. This does not include travel, however. Overall, international adoptions are faster, but obtaining details about the child such as his medical history can be almost impossible. By far the least expensive way to adopt (averaging between $0-$2500), adopting through the foster system is a viable means of adopting a child. However, adoptive parents have less choice in the age, race, gender, and other particulars regarding the child they want to adopt. Understanding how the process works and the variables involved go a long way in facilitating the adoption process. My Storytime Friends – So cute! This is just perfect! I can’t wait to get my own (ordered my own My Storytime Friend from Amazon today!) to see it for myself! Great for kids 3-8! Click on the video to see the selection on Amazon.com. My Storytime Friends(tm) is an interactive toy and storybook set for children ages 3-8 that is both entertaining and educational. The My Storytime Friends(tm) set includes a unique combination of a plush stuffed animal, an inspiring hardcover storybook and a lifetime membership to the My Storytime Friends(tm) Book of the Month Club. Membership also includes free access to My Storytime Friends(tm) online, an interactive place to learn and play. Kids will love watching their cuddly toys come to life as characters in the new stories each month. Parents and Grandparents will appreciate the positive life lessons the stories teach children about overcoming challenges, helping others and achieving dreams.